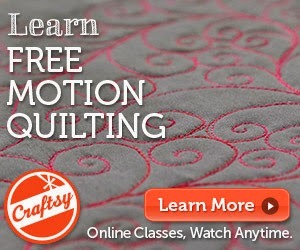 More or Less Quilting -- Mission IMPOSSIBLE! 4. Get it done. Don't quilt for show. 5. Be transparent. Be willing to show what doesn't work. Well.... I recently finished quilt #4: First Love and I am going to be transparent and tell you what didn't work. In the white, I quilted swirly feathers, echoed them 1/4" away, and pebbled the background up to the solid line 1/4" away from the red stripe. In the red, I quilted ribbon candy. Who is shocked by that? In the black, I quilted diamonds up to the solid line 1/4" away from the red strip. I filled the space between the diamonds with ribbon candy (again, who is shocked?) and quilted stars in the middle of each diamond. I liked that quilt, but needed to change something before I quilted the next quilt. I decided to use FabuLux First Love thread from WonderFil (purple, pink, and teal). The one thing I changed was to not finish all of the rows of diamonds. Can you see it? No? You can see the diamond stitching much better in this photo, but the white hurts my eyes. Maybe some color correcting on the computer will help? The stitching shows well (yay!) 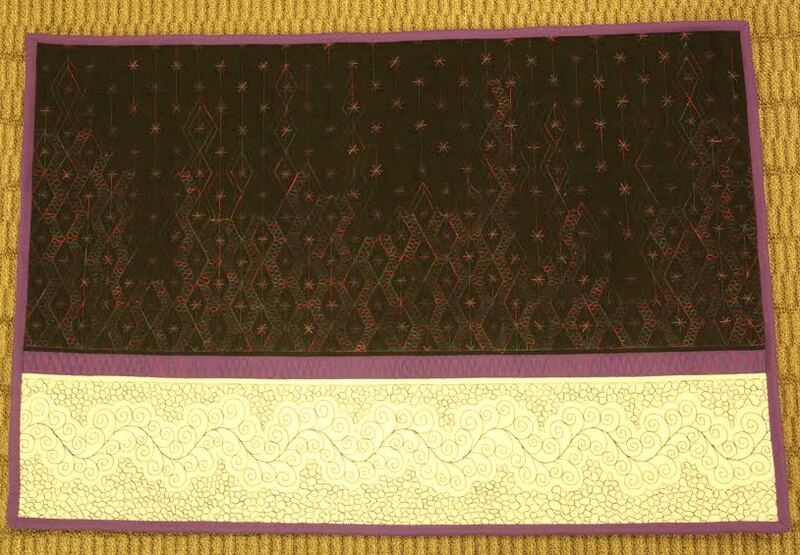 but the quilt is actually black, white, and purple. Millions of thanks to Barbara and Ben Skaught for their photography efforts with this impossible-to-photograph quilt. Your photos at least show the stitching, and that was something I was unable to accomplish on my own. So how was that for being transparent and "keeping it real"? I stitched this on my sweet Sweet Sixteen named Hazel. She and I had a great time! White Fabric: I used my Handi Quilter Wave Ruler to stitch the spine, added some spiral feathers, and echoed with my 1/4" foot open-toe foot. I added pebbles and stitched all of the way to the line 1/4" away from the purple stripe. I rolled a die and let chance determine how many diamonds I stitched in each row. After I stitched all of the diamonds, I had to fill the in-between areas with ribbon candy and figure out how to outline the uneven edges of the diamonds. Then I added stars inside each diamond. Here's a brief video explaining the differences. Warning: the quilting is REALLY hard to see on the last quilt. So what did I learn from this quilt and what might I do different next time? 1. I learned that this quilt is impossible to photograph. Contrast matters! 2. I learned that this quilt is too large; my next one will be smaller. 3. I learned that I like this "dissolving diamonds" look but want to improve the transitions and outlines around the uneven diamond edges. The next quilt will be quilted with FabuLux Tropical Fruit Salad thread from WonderFil. The contrast should be better (oh please, let it be better!). I hope to make the next quilt about half the size of this one. I'll show the next quilt in next week's newsletter. Stay tuned! *I was tickled to select the colors for the FabuLux line of thread. I'm teasing you with these samples, because the thread is not yet available for purchase. Keep checking in and I promise to make a huge announcement as soon as you can buy it! I have a fab friend named Zoë. She's so wonderful that I make sure to type the umlauts and I wouldn't go to that trouble for just anyone! She's smart, too! She's helping me with my website and other online details that make me want to stick a seam ripper in my eye. My website and my eyes thank her daily! This is a scrappy version of my Sweet Tooth pattern. It is a happy quilt and it made me think of her. It may be summer now but, to quote the Stark family, Winter is coming! I am enjoying my More or Less quilt project and watching my quilting design evolve from quilt to quilt. This quilt features a spool of Majestic Sunrise, a FabuLux thread. I was tickled to have designed 40 colors for this yet-to-be-released thread line from WonderFil. What quilter doesn't love some diamonds? So how was this different than the last More or Less Quilt? The new FabuLux thread is called First Love and I'm so excited to use it! What changes should I make in this quilt? The AQS Quilt Week in Syracuse, NY last week was so much fun! There were Salt Potatoes, chocolate cake (no, I never share), and homemade chocolate chip cookies (Thanks, Deb!). There was a beautiful hotel with a brief lack of Diet Coke. I forgave them because the hotel and furnishings were just so pretty! There were also quilts and classes. As much as I love working at quilt shows, I love working at home, too! I get to work in my studio for a whole week! I wonder what mischief I can cook up while I'm home? I love my children equally, but I really do have a favorite quilt pattern: Squared Away. I've designed many patterns over the years, but I'm fairly obsessed with this one lately. I made this quilt with 48 blocks instead of the pattern's suggested 30/64. I also added a border to make this quilt 69x90. Like I said, Coolest Auntie Ever! In case you doubt my love for my Squared Away pattern, allow me to show you a few other Squared Away quilts I have made. What fabrics would you use with this pattern?